Home » Drag Racing » Other Drag Racing Series » Elite Motorsport Elite 16 Over $125,500 Payout! 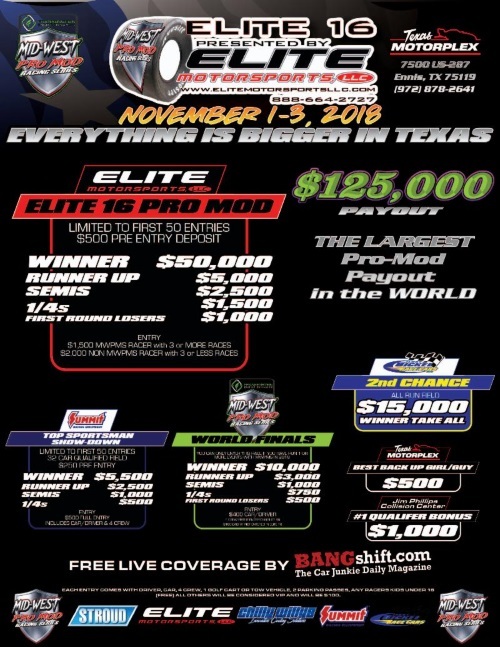 Elite Motorsport Elite 16 Over $125,500 Payout! If you didn’t make the ELITE 16 don’t worry, Jerry Bickel Race Cars has you covered. The competitors that qualified 17th place and back will have a chance to battle it out for a $15,000 second chance purse. If at first you don’t succeed, try and try again. Top Sportsman brought to you by Summit Racing Equipment will also have the chance to rock & roll. T/S will be a 32-car field battling for a $5500 payday. Runner-up will pay $2500, while semis will take $1000, and $500 for quarter finals. The racers were given the option of a top-heavy purse or spread out and this is the decision that was determined. Pro Mod and Top Sportsman are the only classes held at this event, allowing for specific track prep to showcase these big tire beasts. 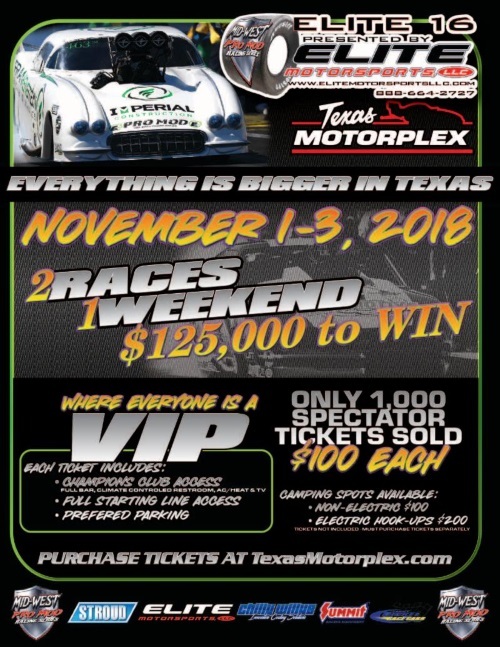 “MWPMS partnered with Tyler Crossnoe’s Outlaw Street Car Reunion in Bowling Green in April and Tyler was a natural choice to bring in to prep the track at the beautiful Texas Motorplex geared solely for these slick tire racers.”. 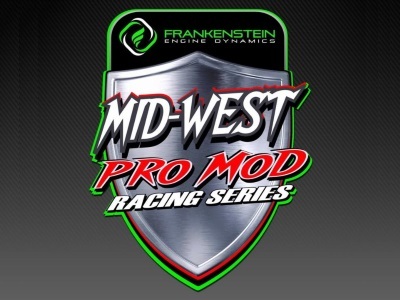 Keith Haney has upped the ante at the end of the year even as the regular Frankenstein Engine Dynamics Mid-West Pro Mod Series points champion will be crowned now in Texas becauuse Tulsa rained out so you get two races in one. 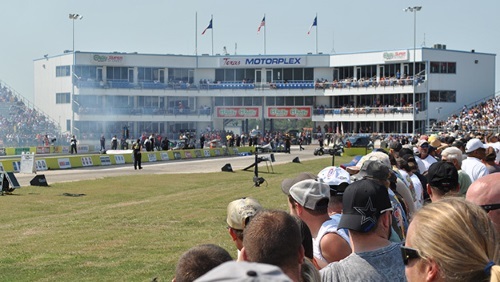 “We wanted to give these racers the place to come from all over the United States to battle it out for one $50,000 purse to the winner, the largest eighth mile purse as Wes Bucks’ World Series of Pro Mod $100,000 purse is invitation-only and contested to the quarter mile”, states Haney. The Elite 16 will begin with 2 rounds of qualifying Thursday, November 1 in the evening. Friday will showcase 6 additional rounds of qualifying. Eliminations will be Saturday morning around 10am. 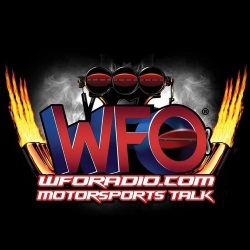 While not everyone will be able to come to Ennis, Bangshift.com, who has been with MWPMS since the beginning, will be providing the live feed free of charge. Spectators will be limited as well to only 1000 purchased in advance via a link on the MWPMS Facebook page and MidWestProModSeries.com. 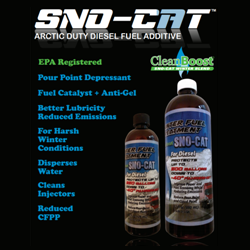 Bangshift.com will provide FREE LIVE FEED and when were aren’t racing we will have in pit interviews with racers and tuners. This is where we will spotlight all the action in pits and most of all the racers sponsors.